Under the direction of the Defence Council management of Armed Forces is the responsibility of the Service Boards, in the case of the Royal Air Force the Air Force Board is the senior management directorate. Attended by senior RAF commanders, the AFBSC dictates the policy required for the Royal Air Force to function efficiently and meet the aims required by the Defence Council and government. The Chief of the Air Staff is the chairman of the Air Force Board Standing Committee. Decisions made by the Defence Council or the Air Force Board are implemented by the air staff at various headquarters world wide. The Chief of the Air Staff is the officer ultimately responsible for the Royal Air Force's contribution to the national defence effort. He maintains control through the AOC (Air Officer Commanding), and the staff branches of the various Royal Air Force Headquarters. Air Chief Marshal Sir Stephen Hillier is the Chief of the Air Staff, in command of the Royal Air Force, leading a Whole Force of some 35,000 Regular and Reserve personnel, and 5,000 Civil CAS web Servants, supported by thousands of contractors. He is personally accountable for the safe and effective operation of over 700 manned and unmanned aircraft and for meeting the airpower needs of Defence, which currently means thousands of people and every front-line force committed to operations world-wide. In addition to sustaining his people and this exceptionally high level of commitment, he is also responsible for delivering the significant growth in the RAF’s front-line capability announced in the 2015 Defence Review. Prior to assuming his current appointment in July 2016, he was the Deputy Chief of Defence Staff (Military Capability) in the Ministry of Defence between 2012 and 2016, responsible for strategic force design, balance of investment and capability coherence across all areas of UK joint military capability. 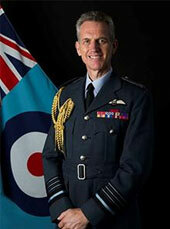 He has significant other experience in MoD capability planning, acquisition and programme delivery, and his most recent previous command appointment was as Air Officer Commanding 2 Group from 2008 to 2010, responsible for the RAF’s ISTAR, Air Transport, Air-Refuelling, Force Protection and Search and Rescue capabilities. A Tornado GR4 pilot and flying instructor, he has over ,500 flying hours and extensive operational and command experience, ranging from squadron pilot to theatre commander of British Forces. He received his knighthood in 2014 and was appointed CBE in 2004. He was awarded the Distinguished Flying Cross for operations over Iraq in 1999, and the United States Bronze Star for Iraq operations in 2003. He is married to Elaine, who has provided incredible support to him and to the wider RAF family for over 30 years, and has two grown-up children. Air Chief Marshal Hillier relaxes through running half-marathons, usually for Service charities, photography, hill-walking and reading.